Salut! 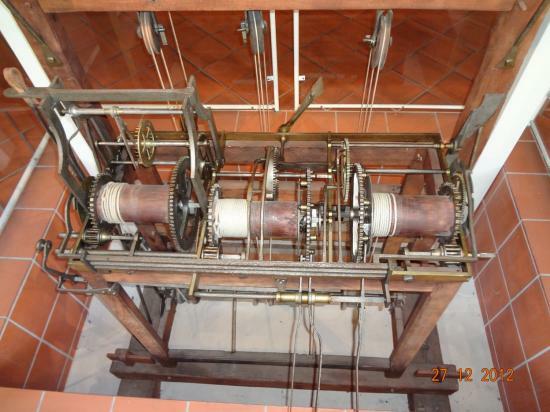 To celebrate the 14th July 2013, I offer you the “Carillon of the Bastille”! 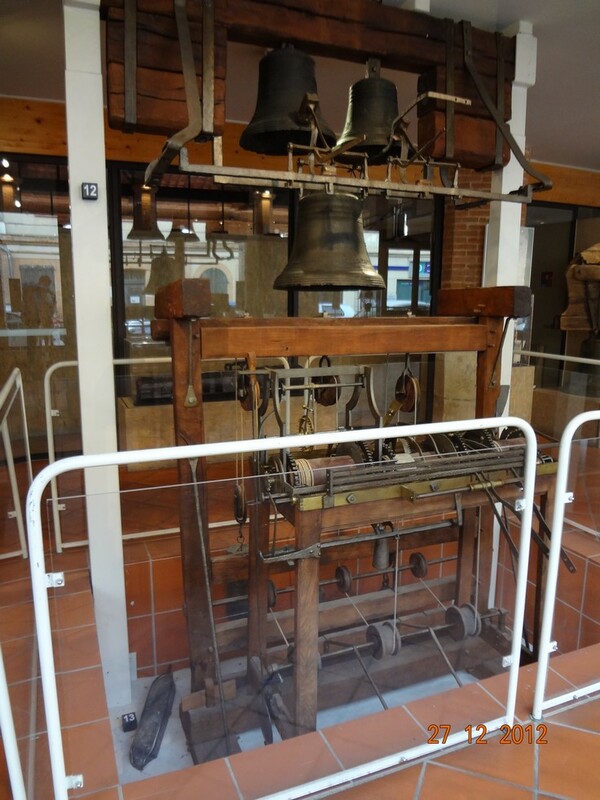 This substantial relic now holds pride of place in a fine modern "Museum of Campanology" opened in 1994 in the commune of L'Isle-Jourdain in the Midi-Pyrénées. We are informed that it is not strictly speaking a "carillon" at all but the prison clock mechanism, with its accompanying three bells. There was originally a clock face which looked out on the main court of the prison and was supported by the figures of two chained slaves - sadly inevitable targets for the liberators of 1789. The bells weigh 125, 75 and 50 kilos respectively. They are ornately decorated and inscribed with the name of their founder, Jean-Charles Chéron (or Louis in the case of the small bell) who appears in a contemporary directory as "Founder of the Prince de Condé", and with the date 1762 (1761 for the small bell). But this degree of care and attention is recent. The carillon only appeared on the official horizon in 1989, when it was dramatically rescued from public auction and possible expatriation at a cost of Fr.620,000, by the timely intervention of museum curator Colette Golfier and French Minster of Culture Jack Lang himself. The identity of the person who sold the Carillon in 1989 is no great mystery. He is M.Jean-Louis Viguès, and he is alive, well and on Facebook, apparently living in Cayenne, having been proprietor from 1978 to 1988 of the restaurant “Au carillon de la Bastille” in Paris. The writer and language school pioneer John Haycraft recounts a meeting with him in his book In search of the French Revolution, published in 1989. Without much hope, we looked around for a self-service restaurant and found one facing the Place. Here, to our delight, we were welcomed warmly by the owner, Jean-Louis Viguès, an exuberant man in his late thirties, who was a Bastille enthusiast. Yes he owned the carillons. Huge they were, made of grey, ancient metal. Originally they had been suspended in the inner courtyard of the fortress. Prisoners had liked their chimes, but after a few weeks, the monotonous repetitions every quarter of an hour had become intolerable, marking as they did the length of tedious time ahead. 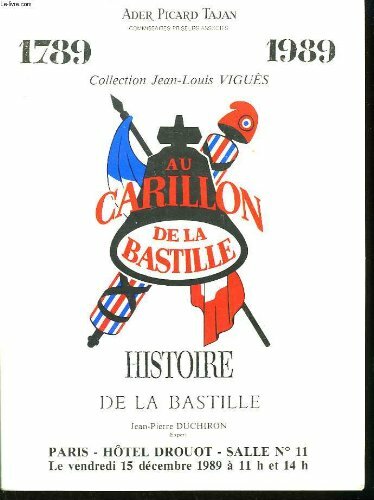 Jean-Louis told us that when the Bastille was pulled down, the carillons were salvaged by an unknown individual and handed down from person to person. Early this century they were acquired by a doctor who left them on one night when he went to the hospital. In the apartment building where he lived they made such a reverberating noise that his neighbours had to call the police to switch them off. When the doctor died, he left them to a patient of his with poliomyelitis, who had to keep them in a warehouse where the storage fees were more than his small pension. So he sold them to a friend who thought it a good idea to exhibit them to the public, and sold them in turn to Jean-Louis Viguès for his restaurant in 1979.